The pilot fuel and burner fuel system pressures are monitored on a single duplex gauge located on the dashboard. Of the two large gauges on the dashboard (the other is the steam pressure gauge) the fuel systems gauge is to the right. This gauge has two scales and two needles. The outer scale, printed in black markings, and the black needle are for the burner fuel system. The inner scale, printed in red markings, and the red needle are for the pilot fuel system. The pilot fuel system portion of the gauge displays a maximum of 50 PSIG while the burner fuel system portion of the gauge displays a maximum of 200 PSIG. This gage design allows for the normal operating range of both gauges to be between 11 o’clock and 1 o’clock and permits the driver at a quick glance to determine if both systems are operating within acceptable limits. 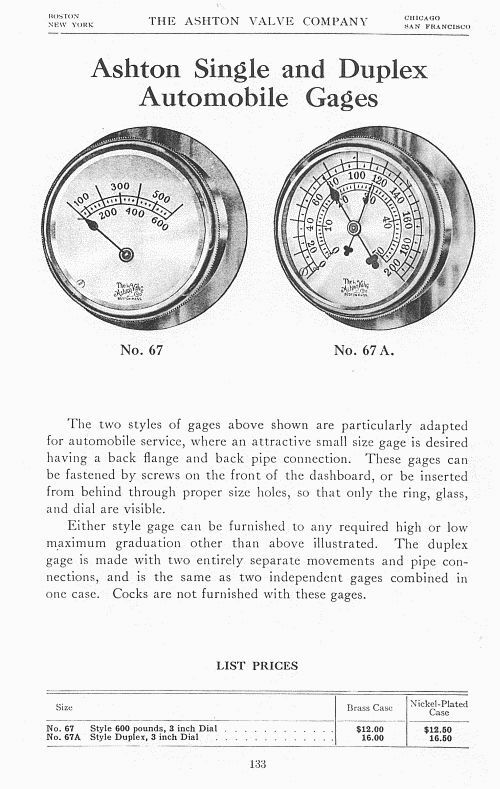 To the left is a page from the 1919 Ashton Valve Company catalog showing the gauges typically used on Stanley steam cars. The gauges were custom manufactured for Stanley by the Ashton Valve Company. In the case of the fuel pressure gauge a nickel-plated Ashton Duplex Automobile Gage #67A was used. The gauge's construction is known as a bourdon spring design. Internal to the gauge are two bourdon tubes, one for displaying the pilot fuel pressure (inner scale) and one for displaying the burner fuel pressure (outer scale). Each bourdon tube is mechanically linked to a dedicated pointer on the gauge face thus making the gauge able to independently display two different variable pressures. Bourdon spring gauges, are sometimes referred to as Bourdon tube gauges as the construction of the gauge relies on a coiled tube bent in the shape of a horse shoe. The spring was commonly made of seamless tubing, drawn from phosphor-bronze, rolled to a curvature and surface hardness which insured permanent accuracy in operation. The Bourdon tube only becomes the Bourdon spring when the tube has been flattened slightly forming an elliptical cross section, then is bent in a horseshoe shape. One end of the coiled tube is attached to a pressure or vacuum source and the other end is closed off and attached through a linkage to a pointer. The bent tube or spring has a tendency to straighten slightly when pressure is introduced. This straightening action is conveyed to the pointer. As varying pressures are applied, the pointer indicates the pressure applied to the gauge's bourdon tube or spring according to an index marked on the gauge's face or dial. 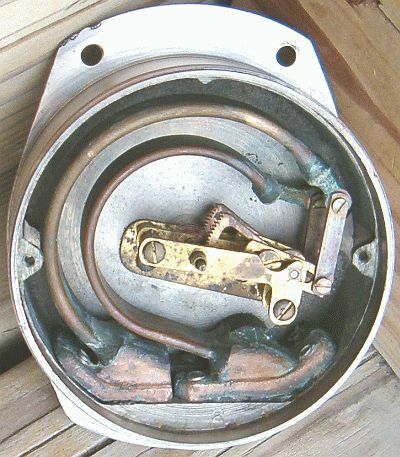 The catalog page and photography of the interior of the fuel gauge (below) is courtesy of Barry David and his book "The Antique American Steam Gauge, A Collector’s Guide" (available at www.astragalpress.com). 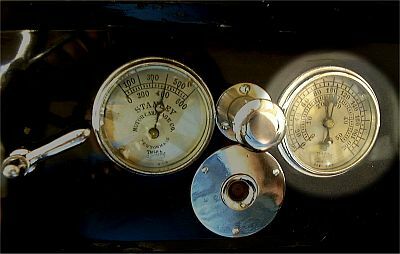 It is interesting to note that while these gauges sold for $16.50 originally, today they typically sell for several hundred dollars when one is lucky enough to find one. For a more detailed discussion on the operation of a bourdon-tube gauge please see the discussion on the steam pressure gauge by clicking on the link below.